Parkinson’s disease (PD) is a progressive nervous system disorder that slowly isolates people by taking away their mobility and fine motor control. An estimated 1 million people in the United States are living with Parkinson’s and suffer from symptoms including tremor, stiffness and impaired balance. Sixty percent of these individuals experience freezing of gait, a phenomenon where individuals feel as if their feet are stuck to the ground and their ability to walk is blocked. The severity of freezing of gait symptoms can last only a few seconds followed by resumption of walking, or lead to minutes of total immobility, all of which can result in falls and injuries. Unfortunately, medications rarely help with this problem and, in some cases, can actually worsen the problem. Now, a Mid-Atlantic research team with roots at the University of Delaware has received a $440,000 grant from The Michael J. Fox Foundation for Parkinson’s Research (MJFF) to test a device, called VibeForward, that uses vibration therapy to reduce symptoms of freezing of gait in patients with Parkinson’s. Non-invasive, lightweight and portable, and equipped with a rechargeable battery, the device is worn on the foot inside of a shoe, making it ideal for use in everyday life. VibeForward was developed by Resonate Forward LLC, a UD startup company. It evolved from early work on the PDShoe at UD’s Parkinson’s Clinic by former faculty member Ingrid Pretzer-Aboff, who is now at Virginia Commonwealth University (VCU). Resonate Forward is loaning VCU several VibeForward devices to test the effects of vibration on Parkinson’s tremor and on Parkinson’s gait and balance issues. The new funding is part of an MJFF initiative launched last fall to evaluate non-pharmacological interventions for the treatment of gait and balance disturbances that have the potential to significantly improve the daily lives of people with Parkinson’s. Only eight projects from around the world were awarded grants, according to an MJFF announcement. Device design is an iterative process that takes collaboration, communication and even some humor. Pictured from left to right: Prof. Richard Martin, UD junior Theodore Fleck, Prof. Scott Jones and Ingrid Pretzer-Aboff, senior nurse scientist at Virginia Commonwealth University. While at UD, Pretzer-Aboff’s work with the PDShoe aimed to help people with Parkinson’s to walk more steadily and smoothly by providing vibration that was synchronized to the heel strike and toe-off of the person wearing it. Early evidence showed that vibration therapy applied to the feet can help reduce freezing of gait. The researchers don’t know with certainty how the mechanism works. Pretzer-Aboff, now a VCU senior nurse scientist, said the vibration may trigger an alternative pathway for movement generation in the brain. It also may be that the vibration is stimulating the nervous system, thus enhancing the communication channel between the brain and foot. Resonate Forward licensed the PDShoe technology through UD’s Office of Economic Innovation and Partnerships and developed it into a miniaturized, patient-friendly prototype that can be discreetly worn on both feet and ankles. Seed funding from UD’s Horn Entrepreneurship Blue Hen Proof-of-Concept program and Delaware’s NSF Established Program to Stimulate Competitive Research (EPSCoR) provided support to get the startup off the ground and enabled technical advances on the device. Specialized training through the NSF I-Corps Sites program, administered by Horn Entrepreneurship, fostered the team’s innovation mindset as they work to transition the technology into a marketable product. Richard Martin, UD associate professor of electrical and computer engineering, joined the Resonate Forward team as chief technology officer in 2017. He and his student Theodore Fleck, a junior studying computer engineering, have been working to improve VibeForward’s electronics and communications capabilities. It’s both a professional and personal labor for Martin, whose father has Parkinson’s and experiences freezing of gait. “I remember walking with him at a church service and he just stopped and said ‘I can’t move my feet.’ It’s hard to understand, but it just does that,” said Martin. 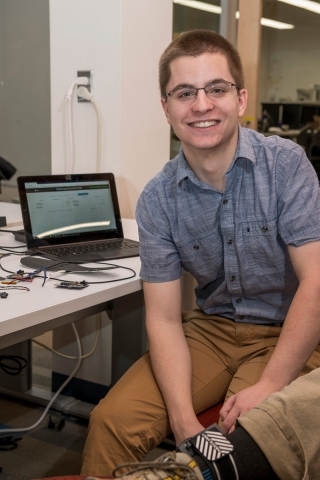 UD computer engineering major Theodore Fleck is working with Prof. Richard Martin to improve VibeForward’s electronics and communications capabilities. 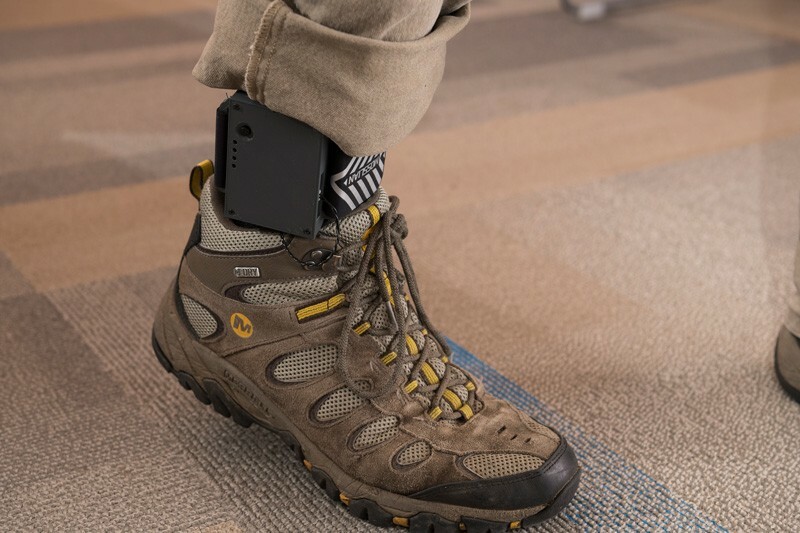 When activated from a smartphone app, the VibeForward device vibrates and sensors collect data about the person’s position and gait. Recent technology upgrades include a new web interface, built by Fleck, to remotely control the vibrating motors and log the data collected by the various sensors. For example, an accelerometer measures how fast and in what direction the wearer’s leg is moving, 10 times per second. It’s the kind of data that might help a clinician or physician pinpoint when a patient “got stuck” or provide important clues about whether the individual was standing, sitting or lying down at a particular time. “Potentially, you could know when a person is standing but not moving based on data from the pressure sensors,” said Martin. Because the device’s internal microprocessor (a sort of minicomputer) is Bluetooth and Wi-Fi enabled, downloading the data onto a computer or adjusting the vibration settings is easy and more convenient than with previous versions of the device. Martin and Fleck recently demonstrated these upgrades for Pretzer-Aboff and UD Professor Scott Jones, who also is involved in the project. During the meeting, Pretzer-Aboff noticed a wire on the wearable device that potentially could rub against a person’s skin. She mentioned it to the team and, suddenly, everyone was talking at once, tossing out solutions to ensure the device is functional and comfortable. Looking ahead, Martin said the idea eventually is to have the device be smart enough to sense the person and adjust support as needed, or maybe even have the artificial intelligence capability to modify itself from learning about the user. The device isn’t there yet so, for now, he and Fleck are readying several prototypes for Pretzer-Aboff to test the vibration therapy’s effectiveness in a clinical trial at VCU. 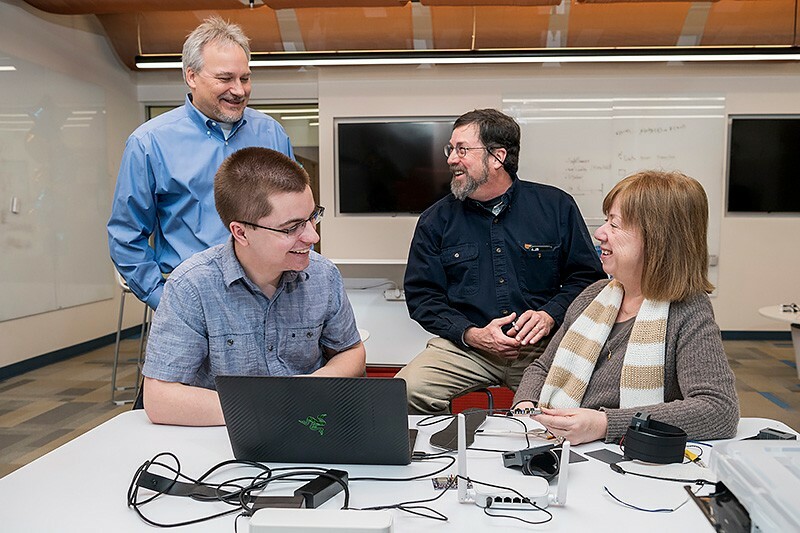 UD junior Theodore Fleck (far left) demonstrates the web interface he helped build to remotely control the device’s vibrating motors and log the data collected by sensors for Prof. Scott Jones and Ingrid Pretzer-Aboff, senior nurse scientist at Virginia Commonwealth University. Initial work under the MJFF grant will focus on determining how large a dose of therapeutic vibration is needed, for how long and at what intensity, in order to reduce the occurrence and severity of freezing of gait episodes. “We’re starting to piece together what is working, or not, and why. This new funding is validation that what we’re doing is important for the people we want to serve,” Pretzer-Aboff said. Param Sreekanth, an expert in new ventures and mergers and acquisitions, formerly with DuPont.